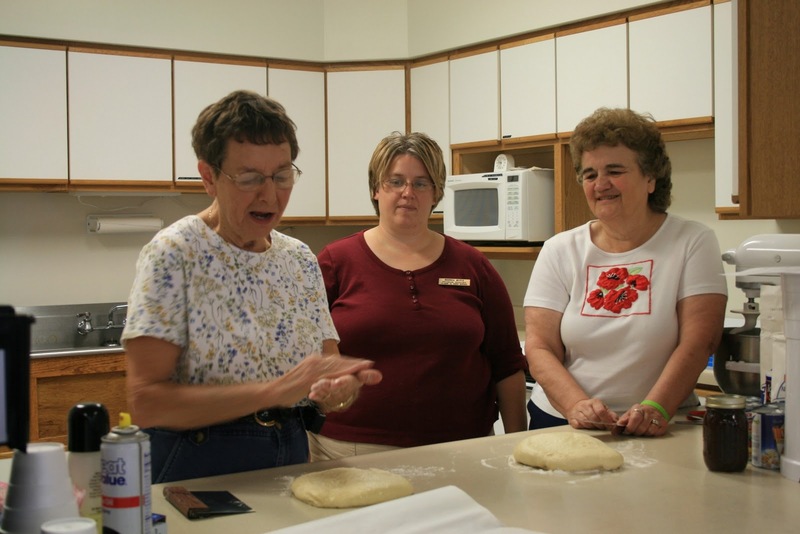 Shirley Brunkow, left, shows Brenda Motis, middle, and Irene Brekke, how to properly roll the dough balls to make the kolaches. Shirley Brunkow shows some of the women at her kolache demonstration how much the kolaches need to rise after they are filled. From the left around the table are Shirley Brunkow, Irene Brekke, Evelyn Michl, Shirley Janes, Evelyn Elznic, Melanie Papik, LaVonne Guthrie and Darlene Becker. Shirley Brunkow, middle, teaches Kierra Papik how to press the kolache dough balls just right as Roma Rhodes stands by with the filling. “When people say you have to be Czech to make a good kolache don’t believe them. Baking good kolaches takes more than a recipe. 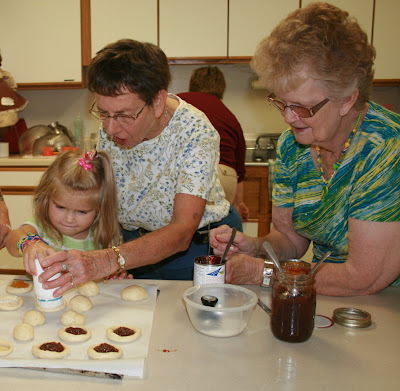 The only way you will be good at making kolaches is doing it a lot,” Shirley Brunkow told a group of women gathered at the Exeter Senior Center on Thursday. Brunkow, of Milligan, and her kolache recipe were featured in November 2009 on “The Recipe Box” a NETV show that highlights regional ethnic recipes. Her story and her technique were of great interest to the crowd at the Senior Center. Several of the group served as Brunkow’s assistants as she mixed up a batch of dough to make her kolaches. Brunkow is trying to ensure that her children and grandchildren don’t have to learn how to make kolaches the hard way. She has spent time with each of her granddaughters teaching them the art of baking a good kolache. 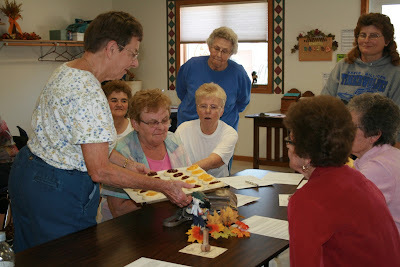 Part of the point of the class at the senior center was that it wasn’t just a demonstration, it was very hands on. Guests at the senior center washed up and many took a turn forming the dough balls under Brunkow’s watchful eye and then using her homemade “stomper” to push down the dough and fill the kolaches. While the dough set to rise, Brunkow shared about her experience with “The Recipe Box.” She shared how she was chosen as one of the six finalists, a little about the taping in her home on Good Friday in 2009 and then the celebration tasting in Omaha in March of this year. For the tasting, all of the six finalist’s recipes were prepared by the culinary art students at Metro Community College. After the show Brunkow received over 100 phone calls about her appearance. “No, they weren’t looking for my recipe, they wanted to know what I used to stomp down the dough. My daughter didn’t think I should use my homemade stomper (a vitamin bottle with the top covered in cheesecloth) so she found me a fancy coffee tamper that was the right size,” explained Brunkow. The group at the Exeter Senior Center enjoyed the afternoon with Brunkow, gleaning tips and tricks from her that many of these experienced bakers hadn’t heard before. When it was coffee time and the kolaches had cooled enough, they ate and enjoyed the fruits of their labor. Making kolaches is an art, especially to those who like to eat them and Brunkow is trying to ensure that the next generation has a chance to enjoy eating their heritage. Lubos from slovakcooking.com here. I just posted my own kolache recipe online. I like the press you are using. Mine were made the old fashioned way, with a rolling pin and a drinking a glass, but a press like yours will definitely come in handy if you are making a lot of them. It's great you are passing on this tradition to the next generation. Keep it up!